The World Economic Forum has produced its The Global Risks Report 2017 detailing many of the trends and risks in the current global economy. Leading think tanks and academia contribute to the different sections of the Global Risks Report devoted to technology, economy and government. The Global Risks Report 2017 Part 3 titled Emerging Technologies lists the 12 most promising emerging technologies for globalists use. The 12 emerging technologies listed are compiled from think tanks and the World Economic Forum Handbook on the Fourth Industrial Revolution not yet released to the public. It is stated in the report these technologies have been determined to have an adequate benefit to cost ratio to humanity. The good for them out weighs the bad for you. The emerging technologies of the Fourth Industrial Revolution (4IR) will inevitably transform the world in many ways – some that are desirable and others that are not. Among these promising technologies listed in Table 3.1.1 are: Geoengineering that doesn’t exist. Mind control and reading thoughts, another supposedly tin foil hat idea, found it’s way on this list made by academia for the World Economic Forum. Androids that take your occupation and synthetic biology appear. As well as Tesla’s wireless energy transfer and brain chips for mind control. Admitting the smart grid is actually there to remotely track and trace everything. As well as holographic image technology and smart drugs. Sounds like every “conspiracy theory” out there has a seat at the table on this list written by the top experts in the world. 3D printing Advances in additive manufacturing, using a widening range of materials and methods; innovations include 3D bioprinting of organic tissues. Advanced materials and nanomaterials Creation of new materials and nanostructures for the development of beneficial material properties, such as thermoelectric efficiency, shape retention and new functionality. Artificial intelligence and robotics Development of machines that can substitute for humans, increasingly in tasks associated with thinking, multitasking, and fine motor skills. Biotechnologies Innovations in genetic engineering, sequencing and therapeutics, as well as biological-computational interfaces and synthetic biology. Energy capture, storage and transmission Breakthroughs in battery and fuel cell efficiency; renewable energy through solar, wind, and tidal technologies; energy distribution through smart grid systems, wireless energy transfer and more. Blockchain and distributed ledger Distributed ledger technology based on cryptographic systems that manage, verify and publicly record transaction data; the basis of “cryptocurrencies” such as bitcoin. 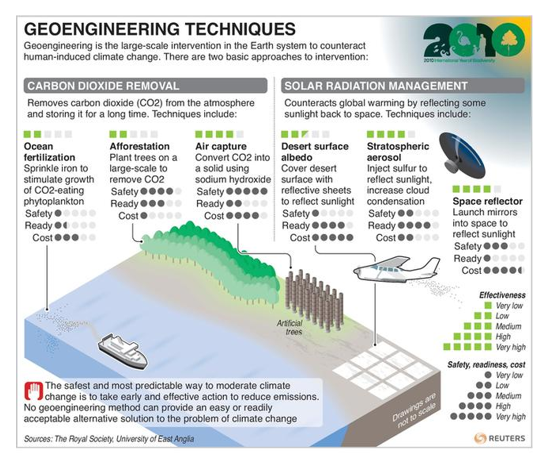 Geoengineering Technological intervention in planetary systems, typically to mitigate effects of climate change by removing carbon dioxide or managing solar radiation. Ubiquitous linked sensors Also known as the “Internet of Things“. The use of networked sensors to remotely connect, track and manage products, systems, and grids. Neurotechnologies Innovations such as smart drugs, neuroimaging, and bioelectronic interfaces that allow for reading, communicating and influencing human brain activity. New computing technologies New architectures for computing hardware, such as quantum computing, biological computing or neural network processing, as well as innovative expansion of current computing technologies. Space technologies Developments allowing for greater access to and exploration of space, including microsatellites, advanced telescopes, reusable rockets and integrated rocket-jet engines. Virtual and augmented realities Next-step interfaces between humans and computers, involving immersive environments, holographic readouts and digitally produced overlays for mixed-reality experiences. This isn’t even mentioning the artificial intelligence that could destroy the world or re-useable space vehicles that are the standard fare for your average futurist. Almost all of the technologies listed have been dismissed as crackpot yet here they are on another globalist white paper. This list was produced from experts around the world not from some wide eyed kid in a internet chatroom. These sciences exist if the World Economic Forum wants to inform it’s membership about the real current state of technology. Yet they are conspiracy theory or fake news if the population most affected discusses the issue.